I would recommend these pulls to anyone looking for a clean and modern look. Other pulls have longer ends which get caught on pockets or clothing while these are shorter and not as sharp. I love these! 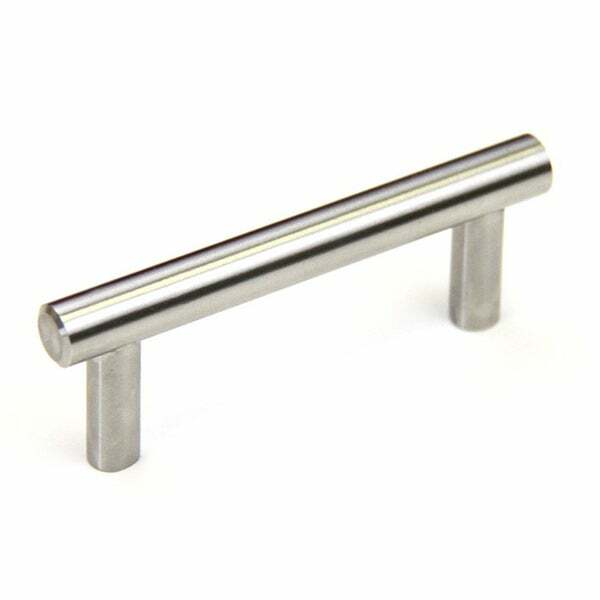 Refresh your cabinets with this set of 15 brushed nickel bar pulls made from durable stainless steel. Beveled laser edges offer a clean finish, and the simple lines offer a modern yet timeless look. Handles offer hole-to-hole spacing of 3" (75 millimeters) and project 1.375" with a diameter of 0.5"
Needed 95 pulls. Good quality. Simple lines and brushed nickel brought out the color of the cabinets. Had about 4 that were off about 1/8 of an inch and couldn't use. Beautiful handles for a great price that I could not match anywhere else. Very solid and sturdy. However, I have to return these (overstock.com is easy to work with as far as returns go) because the alleged 3 inch hole-to-hole spacing is off by about 3mm. This is an issue for me because these handles are for a renovation project where all holes have been drilled from the previous handles. So instead of 75 mm, the holes are about 71 to 72 mm apart. If you use these on previously undrilled cabinets, this would obviously NOT be an issue. For me, however, this issue made the pulls unusable for me. Nicely weighted metal handles with a clean look once installed. We receive multiple compliments whenever guests come to our home. The handles were easy to install and amazingly enough, they still look great 1 year later. I will purchase these again as the price is a great value. These handles are stylish, beautiful and durable. They give my espresso cabinets a really chic look. I love them and the price is right. These cabinet poles look beautiful and modern. A great way to do a mini makeover of our kitchen and bath. Remodeling house, getting rid of the gold. These handles go well with the new cabinet hinges. All parts were packaged, and fit perfectly! Good quality heavyweight pulls! Looks great! Delivered as promised. Nice quality, very sleek and great weight, needed 13 so getting 15 for the awesome price was definitely a perk, will be a great update to my kitchen. They look perfect! Makes my cabinet look really nice. The right quantity and quality at an unbelievable price. "Want to buy 10 Handles of 7 Inch Screw Center to Center 40 Handles of 5 Inch Screw Center to Center 30 Handles of 3 Inch Screw Center to Center 10 Handles of 1 Inch Screw Center to Center Please help"
"How is this handle different from item 15725748 other than the amount in each case? If they are exactly the same, why the great difference in price?" Thank you for contacting us newyorkdecorator. You will be contacted by Customer Care. Please let us know if you have any further questions.